Insulation Testing vs Portable Appliance Testing.. The Australian Standard AS/NZS3760:2003 outlines the parameters by which an appliance can be tested, it does not give an accurate description of the test equipment required. For most part it descibes how to test using Insulation testers. 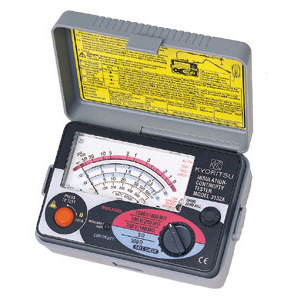 This type of test equipment gives a readout in electrical units (Ohms, Volts etc) and requires good electrical knowledge usually acquired by being a licensed electrician. These Insulation testers are someways adequate, in that they cannot give a definitive Pass/Fail answer. There is a group of Third Generation of Test Equipment available at the moment that can provide a Pass/Fail definitive answer if setup properly by a ‘Competent Person’.. As you may recall from our previous Blog entry a Competent Person is a person who knows how to use test equipment safely and effectively, must have an understanding of the construction of the equipment, the requirements of the standard, the dangers of electricity and the legislative requirement. The best way to ensure that a person is competent and current is to ask if they have a certificate for completion of an Electrical Appliance Testing Course. An Electrician can use an Insulation tester or a PAT tester, however a ‘Competent Person’ with no Electrical trade can only use a PAT Tester. 1) A Portable Appliance Tester gives a Definitive Answer ie PASS/FAIL an Insulation Tester Does not. 2) Most Portable Appliance Testers can test Residual Current Devices (RCD’s) an Insulation Tester Does not. 3) Most Portable Appliance Testers measure Residual Earth Current whilst under test an Insulation Tester Does not. Here at Tested & True ~ test & tag we use the very latest in Portable Appliance Testing…The STC ProLogger 2 it can perform RCD testing, Earth Leakage Detection and Run Testing all in one operation.On top this all our Technicians are Trained to National Standard UEENEEP008 by Intertag in Sydney NSW, all our Equipment is in good repair and in Calibration. Most of all we pride ourselves on our Knowledge of OH&S legislation and the current Australian and NZ Standards ensuring that you get Quality Service at a competitive price.